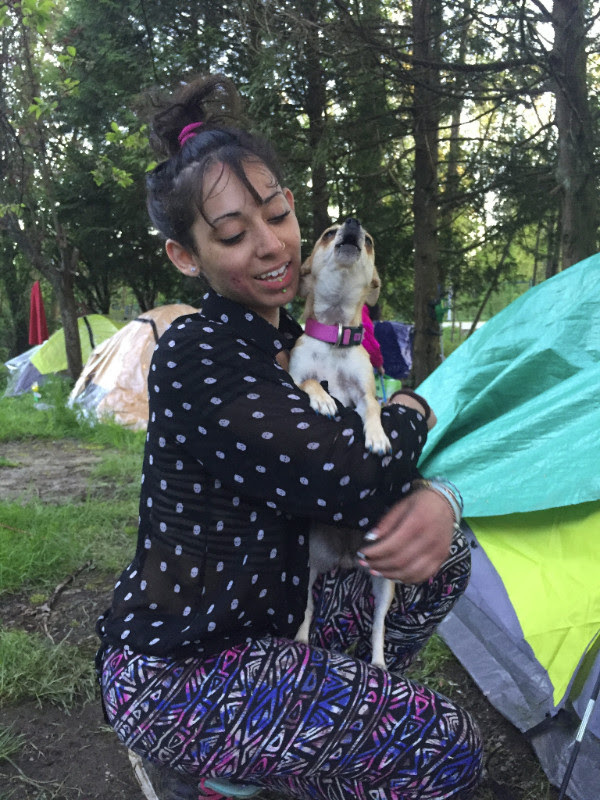 Anita Place Tent City needs your help! The Street Population in Maple Ridge does not have access to the number of resources there are in Vancouver, and as we strain to establish a safe, healthy, strong tent city, the scarcity of resources is showing. Alliance Against Displacement has supplied most of the tents and tarps that are making up the camp, and the need is bigger than we can afford to fulfill. We have collected nearly $2,000 through our online fundraising campaign, but AAD organizers have put nearly twice that on our credit cards – mostly to buy tents. Here are some of the immediate needs: Tents cost $40 each, foam sleeping pads cost $30, tarps (9’X12’ is best) cost $7. If you have tents, sleeping pads, or tarps to donate, we would gladly take them! Contact us atorganize@stopdisplacement.ca to arrange a drop-off close to where you live. Or consider donating $80 to outfit a single camper with a tent site. We also need sleeping bags (or blankets, but bags are better). Supplies like food and clothing are coming in haphazardly from people in the community, and the best donation to help with these smaller and irregular things is to give money so that we can buy them as-needed. On Tuesday May 2nd, a group of two dozen homeless people and their supporters marched from the soon-closed Rain City shelter on Lougheed Highway in Maple Ridge down to a City-owned wooded lot, broke open the construction fencing, and launched a tent city. A banner hung on the fence dubbed the camp “Anita Place” in honour of Anita Hauck, a low-income community leader who had long-tented on the site and who tragically died trapped in a clothing bin in 2015. In the days since the camp started, the legacy represented by Anita Place has shown in the close relationships between campers, the incredible support emerging from surrounding communities, and the strength of the camp as a political space, intervening-in and interrupting business-as-usual politics of the City and the BC provincial election. When campers declared the site their new home they cited the BC Liberal cancellation of housing and shelter and the May 31 closure of Maple Ridge’s only low-barrier shelter as legal reason. And they announced their simple demands: 1) Homes not shelters; 2) For the City to dedicate the site for social housing, and; 3) For the Province to build social housing on the site to take all Maple Ridge homeless off the street. But, as Anita Place founder Dickie explains, “We’re not here just for ourselves. We’re here for the people who aren’t homeless yet,” he said. “A lot of people are just a paycheque away from us; we are here to insure our children have homes – what chance will they have without our help today?” Anita Place is calling for the Provincial and Federal governments to build 10,000 units of social housing at welfare/pension rate every year in British Columbia. In the first three days of the camp, Anita Place doubled in size. As it became clear that the police and City are not planning to attack the camp, more and more homeless people arrived. Mark arrived after being sent from the Maple Ridge hospital to the Salvation Army shelter and being thrown out for nodding out in the cafeteria. Eva came from sleeping under the bridge to the docks. The Kid came from hiding out from bylaw officers deep in the bush. Richard showed up from prison with the clothes on his back. And people trickled in from the Rain City shelter, determined to make their homelessness – a consequence of BC Liberal austerity policies – visible before the election. Every tent city has its own dynamics and Anita Place is coloured by the intense poor-bashing that low-income people face in Maple Ridge. Ridgeilante (Maple Ridge vigilante) harassment and the threat of violence from the white supremacist gang Soldiers of Odin is an everyday threat that Anita Place is combatting by organizing the street population in self-defence. The camp is fenced in with only one gate, and residents volunteer as security and community support at that gate 24 hours a day. Anita Place is part of a bigger fight for housing and for a future without homelessness. Along with the 10 Year Tent City in Vancouver, the Reeson Park Tent City in Victoria, the fight against policing poverty in Surrey, and against the mass-demolition of rental apartments in Burnaby, Anita Place has been pushing the housing and homelessness crisis to the forefront of discussion about the BC election. The homeless and eviction crisis are not addressed by the platforms of either the NDP nor the BC Liberals, and one trip to a homeless camp did not change that. But Horgan’s trip to Anita Place is a sign that the grassroots community fight against the disappearance of homelessness in the BC election is having an effect. While the online spaces of Facebook and news comment sections are dominated by poor bashing, the scene on the ground is different. Yes, lookee-loos are always driving by and glaring, and yes we are worrying about the Soldiers of Odin, but more important has been the surprisingly high level of support from Maple Ridge residents. People are spontaneously bringing coffee and food every morning, church groups are stopping by to help with clean-up and site maintenance, and people from the Facebook group “Citizen’s Bridge” are coming by to say hello, chat with campers, and build community. As one long-time advocate for the Maple Ridge low-income community said, “It feels like a turning point. 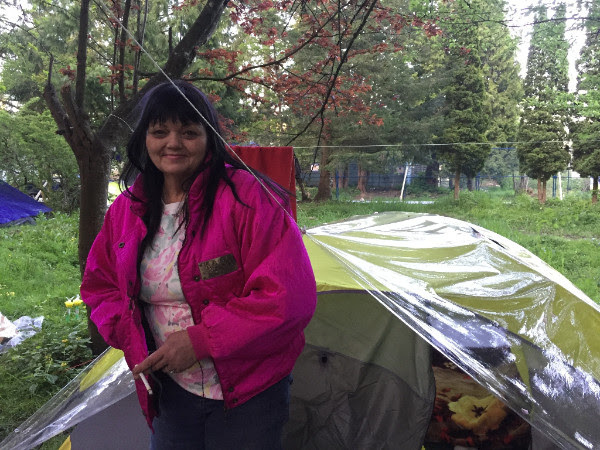 So many people have been looking for a way to support the homeless, and there’s a feeling of relief that Anita Place is here.” To keep building this political support and a change in the culture in Maple Ridge, the camp needs material support too – mostly tents. The City of Maple Ridge – police, bylaw, parks, and fire – has come to the camp every day. Their main concerns have been sanitation, fire safety, and security against vigilante violence. On Friday May 5th the City delivered a written notice that the campers are trespassing on private land with an order to leave. It did not include a deadline for leaving, and they have not made any gestures to enforce it. On May 4th the interim Mayor put out a news release that the City is preparing a court injunction to remove the camp, but specific news of this has not been delivered to the campers. 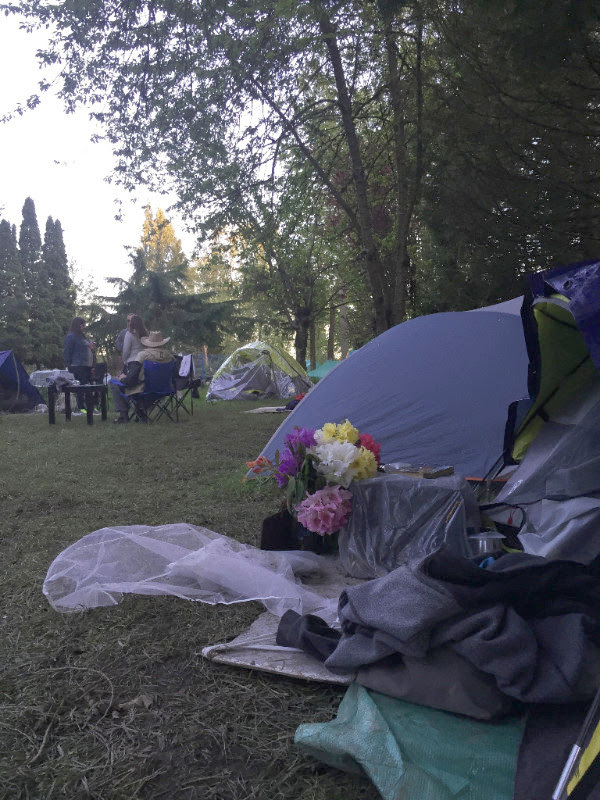 To campers, it feels like the support from Maple Ridge residents is becoming stronger than the hate from the Ridgeilantes, and that City Hall knows that people have nowhere else to go – particularly after the Rain City shelter closes at the end of May. Anita Place may be here to stay. Anita Place has brought a sense of opportunity and change to Maple Ridge; and it’s only just begun. 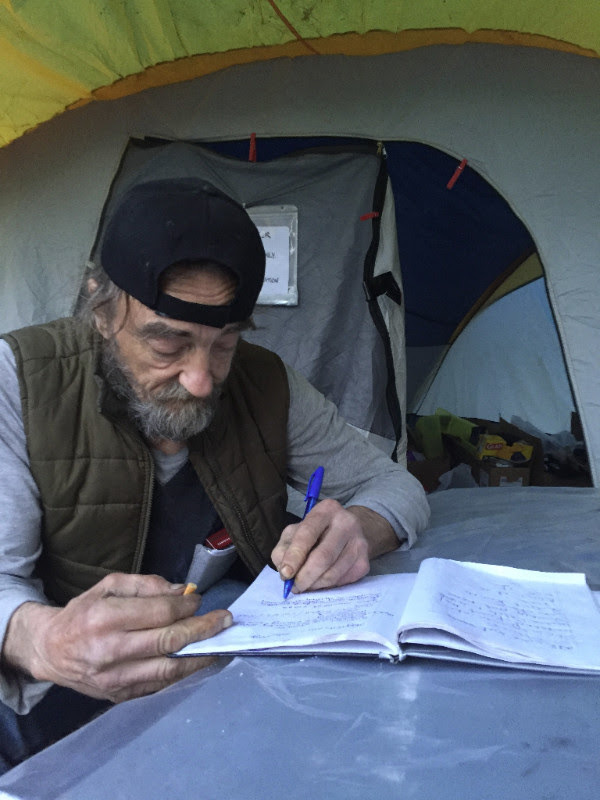 This poem by camp resident and leader Tracy Scott, captures the frustration, determination, and hope that is holding together and driving forward the brave homeless leaders at Anita Place. Now isn’t it a pity? do they actually think we will? Is that what they really believe?